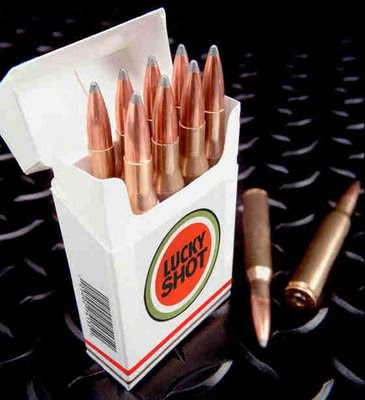 Lucky Shots Mean Fine Targets! The results from the October E-Postal results are up over at Traction Control. I actually made a decent showing this time (thanks in no small part to True Blue Sam's TC Contender.) Of course Mr. C still doubled my best score, but I have learned not to doubt his abilities with a pistol! Better yet, I already shot next month's target and I think I actually got a perfect score on one sheet. We'll know for sure at the end of the month. Very cold and windy today, after 3 weeks on the road, staying in. Loved the Lucky Shot picture. Sounds like you deserve a day in after 3 weeks. Coffee that's out of this world!